Like most countries, Brazil allows visa-free transit if you do not need to leave the international transit area of the airport. This visa can be issued to individuals whose final destination is another country bearing an air ticket with a stop or connecting flight in a Brazilian airport that demands a new check-in while in Brazil. This means that if you are changing flights from companies that do not have codeshare agreements, you will have to exit the international area of the airport, going through Brazilian passport control, officially entering the country. Contact your airline to make sure if you will need to check-in for your connecting flight in Brazil before applying for a transit visa. Visa required, except for Passengers with an onward ticket in transit through Rio de Janeiro Galeao International (GIG). Visa required, except for Passengers with a connecting flight booked on the same ticket in transit through Sao Paulo Guarulhos (GRU). Passengers in transit through Sao Paulo Guarulhos (GRU) with a connecting flight booked on a separate ticket must collect their baggage and re-check their bags in at the OAL counter. To avoid this requirement, book a single round trip ticket for the entire journey. You will then receive both boarding passes when you check in at Lagos, and can remain in the international transit area in Brazil. You will not need visas for Brazil in this case. You can also obtain a Brazil transit or tourist visa. Note that Brazil transit visas are single entry only. Because of this, Brazil recommends that most people who are transiting consider applying for a tourist visa, instead of two transit visas. The requirements for a transit visa are almost the same as those for a tourist visa (VITUR). Tourist visas are usually valid for longer periods of time and can be used for multiple entries. 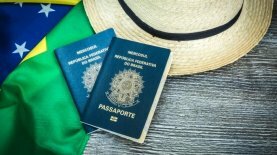 Bearers of tourist visas may use their visa for transit in Brazil. Therefore, it is strongly recommended to check the possibility of applying for a tourist visa whenever possible. Monday 14, August 2017 07:14 PM from Leo.